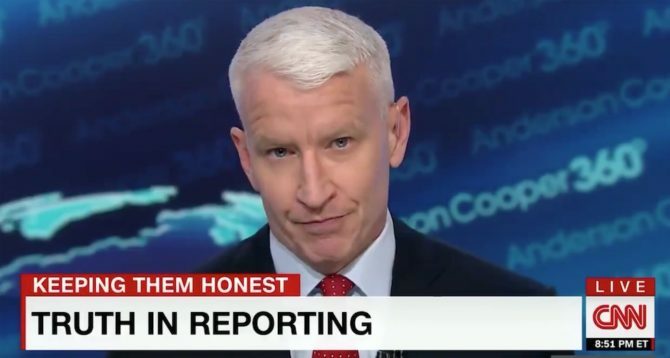 Anderson Cooper has issued a rare rebuttal at online conspiracy theorists — most notably Donald Trump Jr — following allegations of fake news. The out CNN journalist notes in a recent segment that he typically tries to ignore the troll chatter, but after a lie was spread by the president’s son that was so easily disproved, he’s wading into the muck just to show how absurd the situation is. The “conspiracy” claims that Cooper was kneeling in shallow water to make his recent Hurricane Florence coverage look more severe. Except… the photo that “proves” the false claim — the same one shared by Donald Trump Jr — was taken a decade ago while Cooper covered Hurricane Ike. “It’s a shame that CNN’s ratings are down 41%. What’s worse is there’s a simple solution that they refuse to accept. Stop Lying to try to make @realDonaldTrump look bad,” wrote Trump Jr, before sharing a link to a Breitbart article. Cooper also notes one commenter who made a homophobic jab that he’s “used to being” on his knees. “Some guy I’ve never heard of made a joke on Twitter that I was on my knees in the water to make it look deep, and then went on to say I was used to being on my knees,” he says, “which I assume is some kind of anti-gay reference. This spread like wildfire again. But why should people verify anything anymore? Even if you show people the entire clip, they’ll still cling to the “fake”news mantra. Anderson Cooper is reporting the Real News, Donnie Jr. is reporting the Fake News, like his daddy does. If the only place you get your news is CNN and MSNBC, then you’re level of knowledge regarding the news is as if you’re living in an echo chamber. Or……get out of the house a little bit more. Talk to people different from yourself a little bit more. Gone are the good ol’ days when the ramblings of the village idiot were limited to the confines of his or her village. Twitter, and other social media platforms, have given these idiots, on both the left and right, a voice than can be heard around the globe in a millisecond.